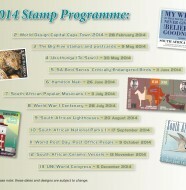 In recognition of the services rendered by 11 Field Postal Unit, the South African Post Office will issue a set of 10 stamps and two first-day covers on 9 October 2012. 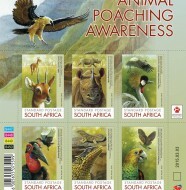 Designed by Jerry Lion, the self-adhesive stamp sheet is die-cut to the shape of Africa. 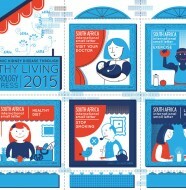 The stamps depict a variety of activities relating to the unit. These include parcels being accepted at Field Post Office 3, Air Force Base Waterkloof, parcels being scanned before being dispatched, mail loaded into a Hercules C130 aircraft at Air Force Base Waterkloof from where it is transported to the various mission areas in Africa, soldiers awaiting the arrival of mail from home at a typical field post office in the mission areas, FPO personnel checking mail and soldiers receiving parcels and posting letters. “We deliver whatever it takes” has a completely different meaning when it comes to the dedicated members of the South African 11 Field Postal Unit (11 FPU). This unit is dedicated to provide an efficient field postal service to the South African National Defence Force (SANDF) and its members, wherever they may be deployed, during operations and/or large-scale field exercises. 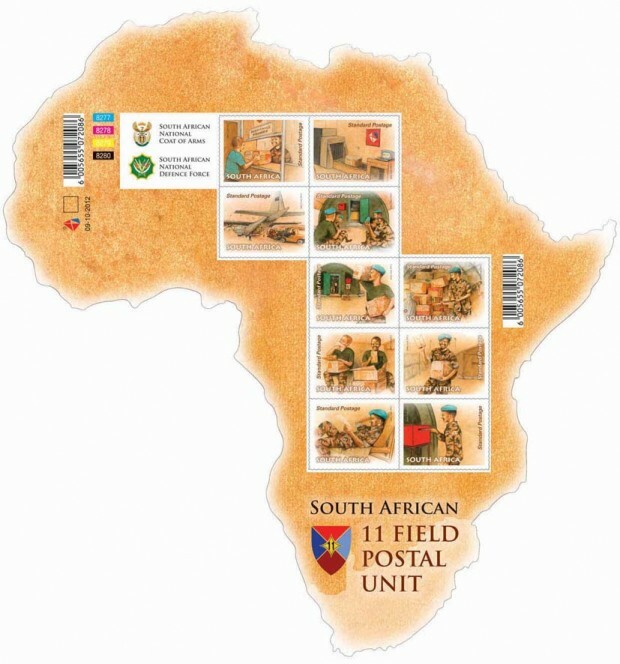 The founding of 11 FPU, established on 1 October 1964, resulted from negotiations between the South African Post Office (SAPO) and the South African Defence Force when the need for an efficient field postal service for troops in uniform was identified. The then Under-Secretary: Posts and later Deputy Postmaster General: Telecommunications, Mr Chris Gouws, was the first officer commanding the unit. Initially, 25 employees from SAPO volunteered to do military service in the interest of SA troops that had been mobilised and deployed. 11 FPU, a Reserve Unit, is fully operational in Africa to this day. It is the only reserve unit that had been deployed continuously since the first South African troops were deployed in Central Africa during 2001. Members of 11 FPU are reserves who sacrifice their time to serve their fellow combatants wherever they may be deployed. All reserves called up for service at field post offices (FPOs) are full-time employees of SAPO. 11 FPU plays a major role in supporting the SANDF. It is a specialist unit, not an extension or duplication of any service rendered by any other unit within the SANDF. As a leader in ensuring that communication channels between deployed soldiers abroad and their families are maintained, its activities are regulated and supported by SAPO. Field Post Office 3 at Air Force Base Waterkloof is the heartbeat of the unit’s operations and its main dispatching hub. FPO 3 renders a valuable service to the troops deployed in the mission areas of the Democratic Republic of the Congo (DRC), the Sudan and the Central African Republic (CAR). 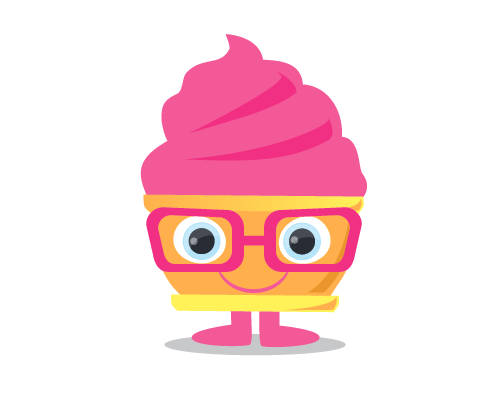 The history of the unit is a story of constant change and adaptation to new circumstances. During the Republic festival in 1966, the unit for the first time rendered a fully-fledged field postal service to participating troops. Since then the unit had deployed more than 50 FPOs during various military exercises and operations in South Africa and abroad. During December 1975, due to circumstances on the then South West African (now Namibian)/Angolan border, an extensive investigation regarding the distribution of mail in the operational area was undertaken. Grootfontein was identified as the main receiving and distribution centre. Following this, 14 members from 11 FPU were deployed at Grootfontein to establish an efficient mail distribution system in the operational area. FPO 2 became operational on January 2 1976. Fully-fledged financial counter facilities were also provided at a later stage. With the deployment of FPO 1 Air Force Base Waterkloof on 1 July 1982, the main mail distribution office, FPO 2, at Grootfontein, was moved to Pretoria. By doing so, the field postal system was improved as mail was now transported by air. When the conflict on the Namibian border came to an end in 1989, FPO 2 was de-commissioned. After the South African Government decided to support the peace initiatives of the United Nations in Central Africa, Field Post Office 3 was deployed at Air Force Base Waterkloof. The unit has made great progress over the past years; it has increased customer confidence and ensured overall customer satisfaction. The unit has extended its range of services at FPO 3 to include electronic money transfers, PostBank transactions, municipal accounts, prepaid phone cards, prepaid Internet services, purchasing of stationery and various other value-adding services.